Sometimes you want something more filling than a bowl of cereal for breakfast. 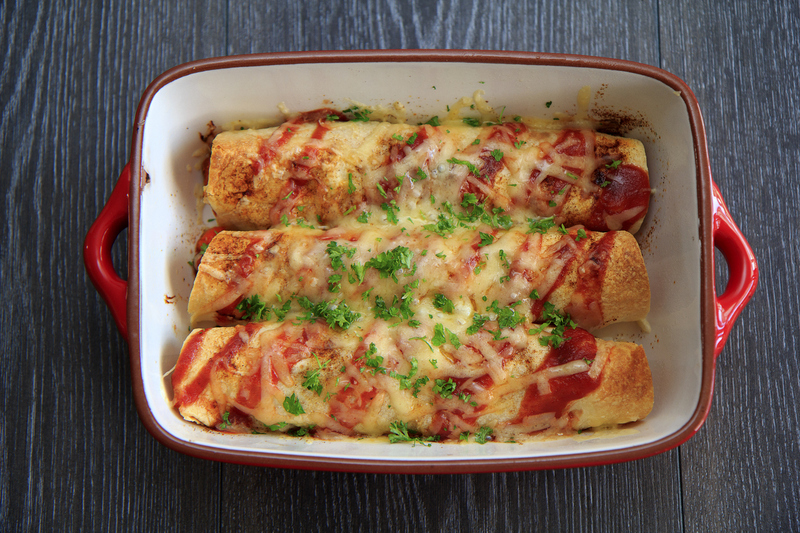 Start the day on a high note with these delicious homemade cheese, bacon, and egg enchiladas. Once you give this dish a try, you won’t be able to go back to eating cereal. Your family will ask to have cheese, bacon, and egg enchiladas all the time for breakfast! It’s a delicious, protein-packed meal that will fill everyone up and get them ready for their day. Preheat your oven to 350 degrees. Spray a 9×13-inch baking dish with cooking spray. Cook the bacon over medium heat in a skillet. Make sure it cooks evenly by turning it occasionally. Cook the bacon until it is crispy. Once the bacon is done, set it on a paper towel-lined plate and let it dry. Crumble the bacon and set it aside. Remove all the bacon grease from the pan except about a tablespoon. Saute the green pepper and onion in the skillet until they’re soft. Beat the eggs, milk, onion powder, chili powder, salt, and black pepper in a bowl until the mixture is blended well. Add the mixture to the onions and peppers and stir the vegetables in evenly. Once the pepper and onion are combined, let the egg mixture cook like you’re making an omelet. When it begins to set on the bottom of the skillet, carefully lift the cooked parts and let the uncooked portions flow to the bottom. Avoid continually stirring the eggs and cook them until they are set. Make sure they are still moist and not overcooked since they will also be baking in the oven. Pour half of one of the cans of enchilada sauce into the 9×13 baking dish. Begin filling the tortillas. You should add about a 1/4 cup of eggs, a tablespoon of bacon, 2 tablespoons of cheese to each enchilada. Roll each enchilada and place them seam side down in the enchilada sauce. After all the enchiladas are in the baking dish, pour the rest of the enchilada sauce over them. Top the sauce with any remaining cheese and bacon. Bake the enchiladas uncovered for about 20 minutes or until they are bubbling around the edges. Sauder Eggs will add a little something extra to this cheese, bacon, and egg enchiladas recipe. Use our store locator to find our top-quality eggs at your nearest store.